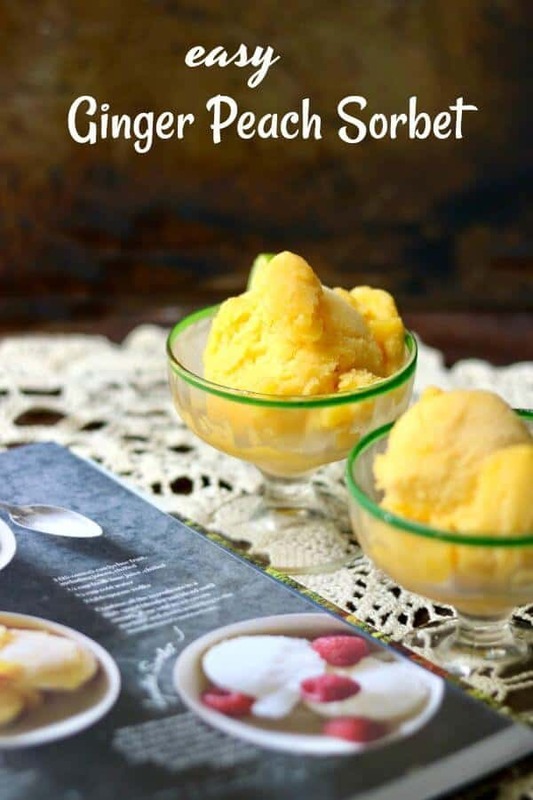 This fresh ginger peach sorbet recipe is unbelievably quick and easy to make! 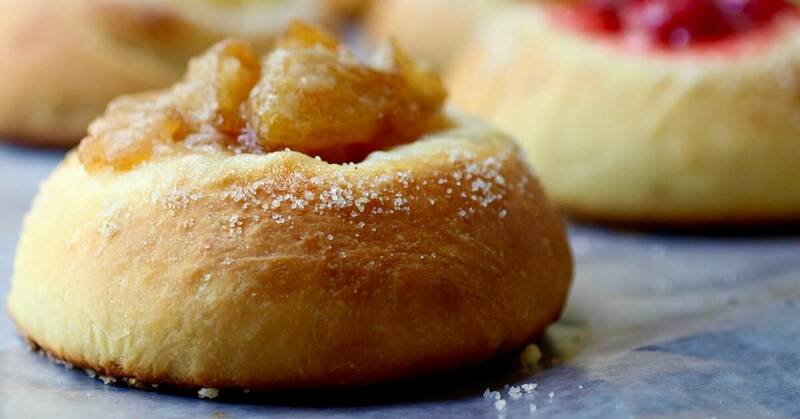 The juicy, ripe peach flavor gets an extra burst of zing from the warm ginger and tangy lime. It’s a great combination that is refreshing and light -perfect for these last days of summer. A big thank you to BabbleBoxx.com , Flatiron Books and Breville for partnering with Restless Chipotle to bring you this recipe. 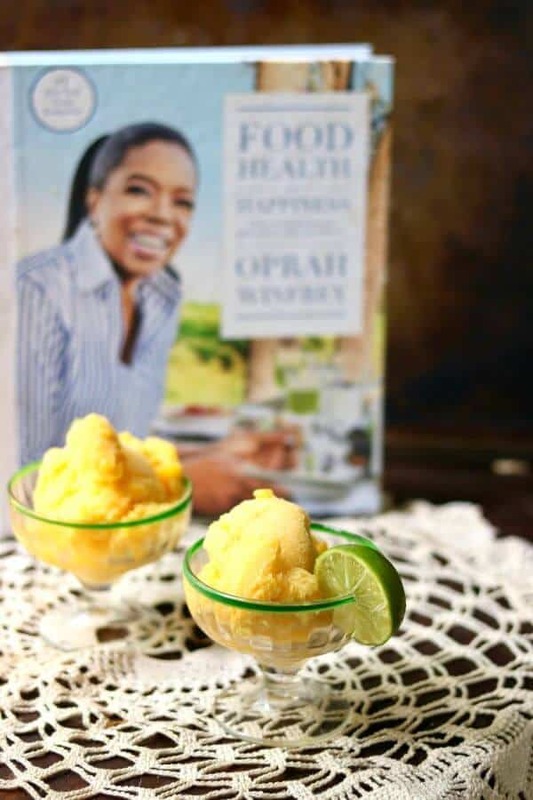 I adapted the Fresh Ginger Peach sorbet recipe from the Oprah Winfrey Cookbook: Food, Heath, and Happiness and made it in the Breville Smart Scoop. I think that I could go on making ice cream all day long with this ice cream maker! Not only is it sleek and beautiful but the Breville Smart Scoop is the first ice cream maker to automatically sense the hardness of the mixture based on what you’re making. When you’re ice cream (or sorbet, or gelato, or froyo) is finished it keeps it ready until it’s time to serve. AND the alarm that goes off to signal that it’s done sounds like the old fashioned ice cream truck – it put a smile on my face! The Smart Scoop is a heavy machine because it includes a self-refrigerating compressor. You don’t have to do a lot of anything besides prepare your ingredients. 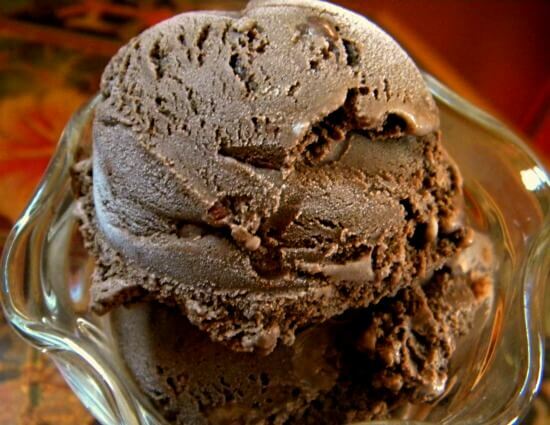 The 12 hardness settings allow you to customize your dessert – ice cream at exactly the texture that you like best! 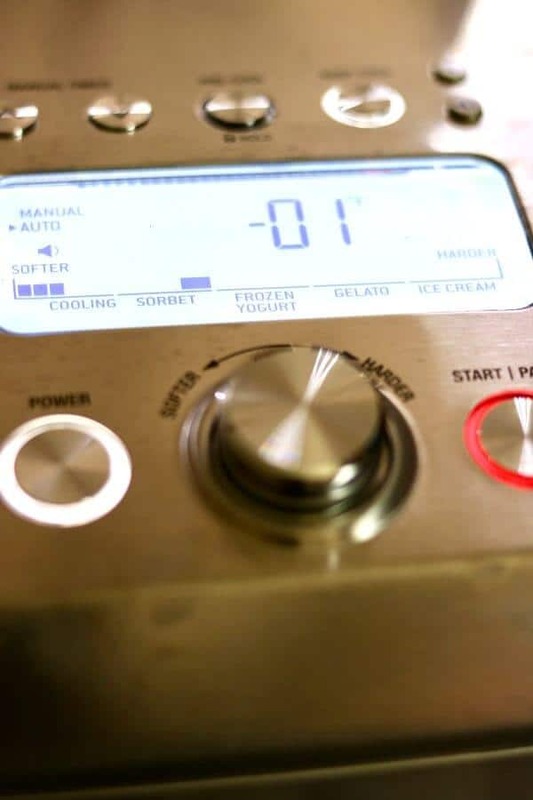 There are presets for sorbet, frozen yogurt, gelato, and ice cream. It includes a manual timer. It tells you when to add in your mix-ins. Fully automatic or manual functionality. Transparent lid with large opening for add-ins. Stainless steel makes it easy to clean and it looks great on my countertop! I literally just blended the ingredients in my blender, poured the mixture into the ice cream maker and turned it on. About an hour later I was enjoying some of the best sorbet I’ve ever had. Food Health Happiness… and Sorbet! It was fun paging through Oprah Winfrey’s new cookbook, Food Health and Happiness. 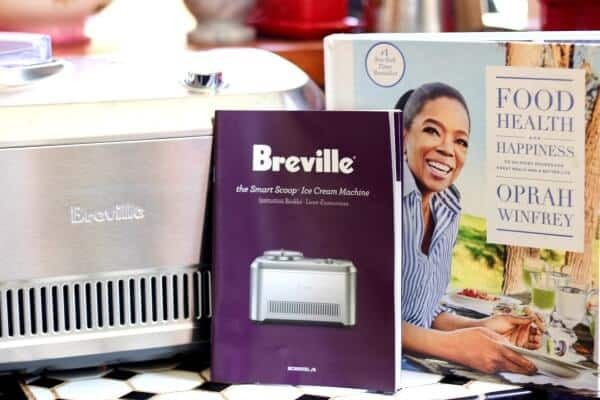 The book has plenty of gorgeous images and anecdotes from Oprah Winfrey plus 115 recipes that even include Weight Watchers points. I particularly enjoyed the honest look into her struggles with her weight and body image. 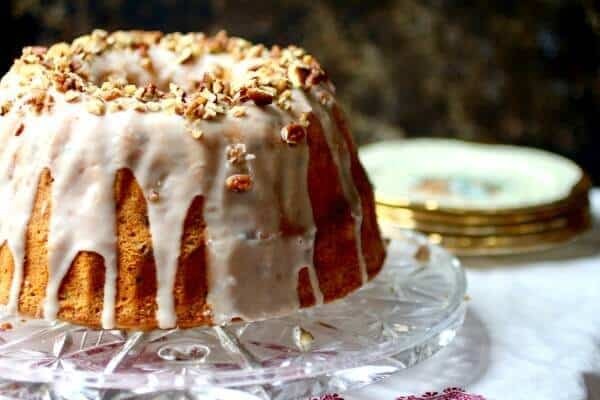 The recipes are easy to prepare and perfect for sharing with family and friends – they are not overly fancy or fussy. 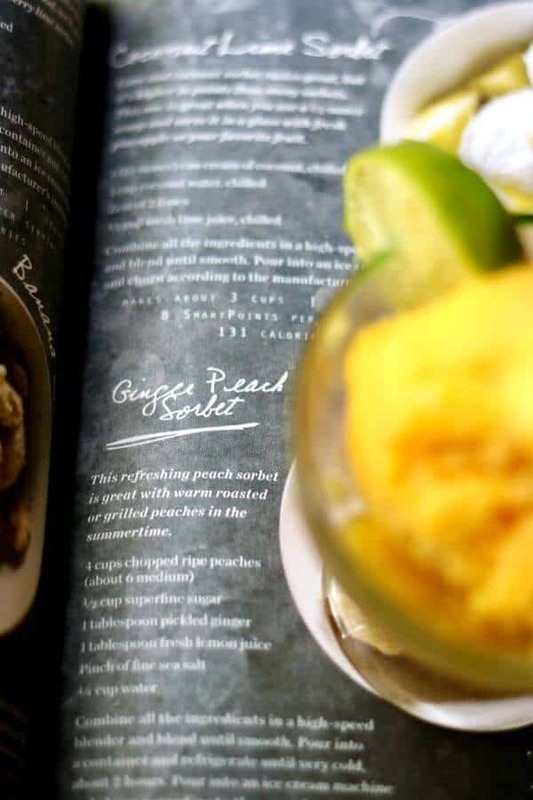 I chose to make the ginger peach sorbet but I made a few small changes. The recipe called for lemon and I substituted lime. Pickled ginger was also part of the ingredient list but I used fresh. The peach sorbet was smooth and creamy with a fresh peach flavor. When my husband and I got married we had a quick honeymoon in Granbury, about 2 hours away. The innkeepers at the bed and breakfast we stayed in served a mango sorbet between courses at breakfast just as a palate cleanser. I think that it’s a great idea to have your breakfast fruit in sorbet form on summer mornings, don’t you? 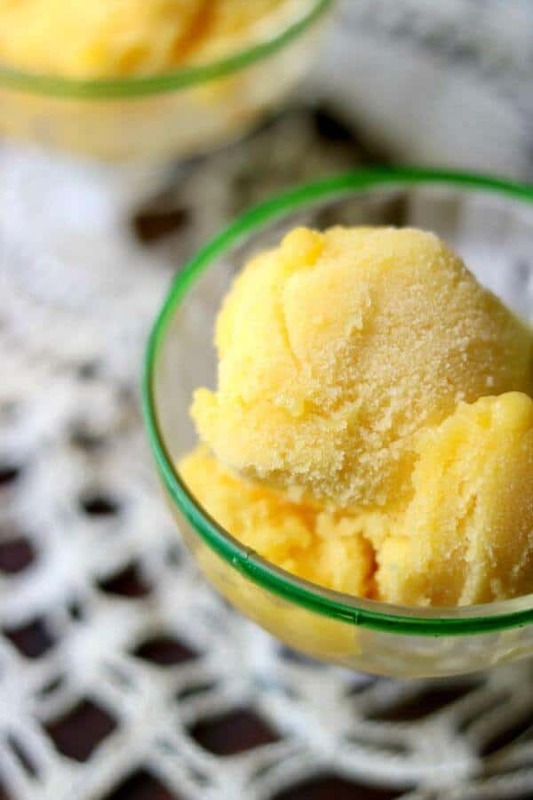 You’ll definitely want to give this sorbet a try! SO refreshing! 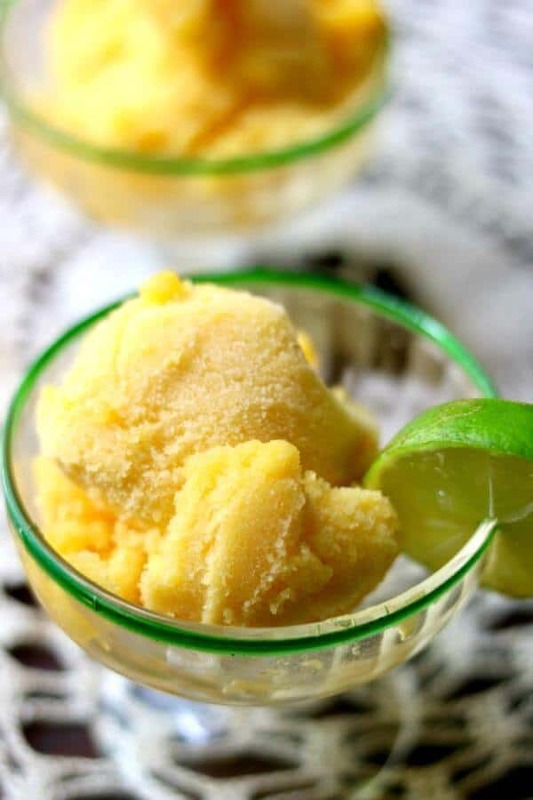 A creamy sorbet with fresh peach, warm ginger, and tangy lime flavors. Easy to make! Pour into an ice cream maker and churn according to manufacturer's directions.